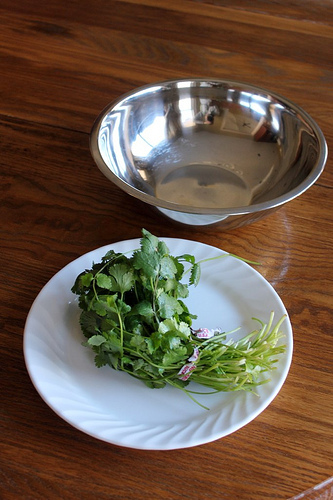 Ever buy a bunch of cilantro when you only need a small bit for a recipe? Or do you plant an herb garden that always overproduces? Wash, remove stems, and chop the herbs. Put roughly 1/2 to 1 Tablespoon of the chopped herbs into ice cube trays (I didn’t measure; I just plopped some into each cube). Fill the ice cube tray with water and freeze. Remove cubes and place in an airtight freezer bag for up to two months. To use in recipes, just pull out the necessary amount of cubes and add to your soup, stew, sauce, etc. If need be, thaw first and then add to your recipe. How simple is that? 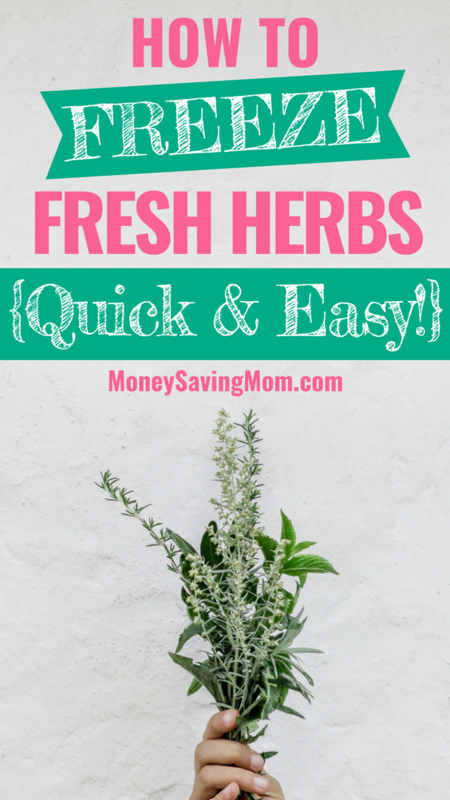 It’s a great way to preserve fresh herbs — and to not let any go to waste before you have a chance to use them! This is great and simple! I have a carrot recipe that uses fresh thyme and I always have extra that doesn’t get used. Love the last photo. Close-up photography is fun, no matter the subject! Food is fun because it doesn’t move! Even easier is to loosely pack in ziplock bag, freeze, and after frozen they can be crushed to make smaller–they don’t stick together as long as you freeze with lots of air in bag–Works well with basil, cilantro and parsley and no chopping! I do this too. It seems easier and then you don’t have the water issue. As long as they are not wet (or they can be wet if there is extra air like you said), they don’t stick. I have made my own garlic cubes before. Just chop (I use my food processor to do a bunch at one time) and stick into the ice cube trays. Once frozen I store them in a ziploc bag. Then I just add to the pan or pot when I need some chopped garlic. No need to add any water before you freeze. I also use EVOO and freeze fresh herbs in that. Perfect to throw in the crock pot or pan for cooking. Yes, my parsley overproduces all the time! I’ll have to give this a try. I often put extra herbs in the oven after baking bread (or anything) and let sit overnight. In the morning they’ll be dried and easy to crumble. The flavor will also be stronger than store-bought dried herbs because they’re fresher. perfect! Love the oven idea to dry them out!!! 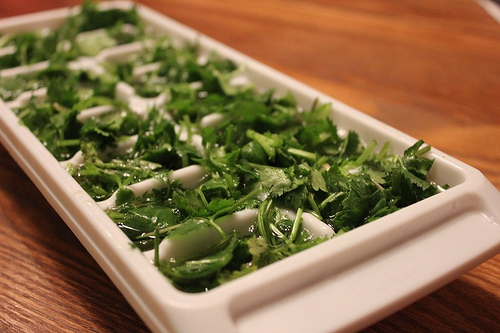 I’ve made basil/oil cubes before, but never thought of freezing cilantro – definitely going to try it! 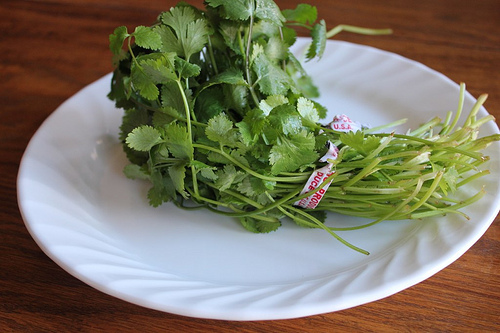 I love cilantro but rarely buy it because it is hard to use the whole bunch before it goes bad. This past summer when we were getting our CSA we got a lot of basil and I found a recipe someplace for Basil Butter Balls. You melt the butter and mix in chopped basil. I then scooped them with my cookie scoop onto a cookie sheet and froze them. After they were frozen I placed them into a container to use, as needed. They taste so good in the middle of the winter on a baked potato or any other dish. Nothing beats the taste of fresh basil in the middle of a Minnesota Winter! 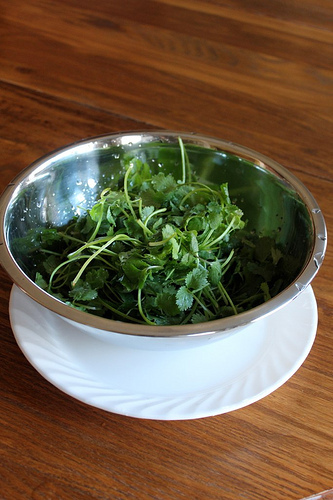 Jessica, if you put the fresh Cilantro in a water filled cup and store it upright in your refrigerator, it will stay fresh much longer than if you leave it in a bag or paper towels in your veggie drawer. You may have to change the water a couple times. I use most of it, then dry and crumble any that’s left. This works for basil (my favorite) leaves too. 🙂 Actually, I stuck the last bunch I bought into a glass on the table, (I don’t have a good window sill) no need to refrigerate. It’s stayed fresh for over two weeks now. I think it might even been growing! Just love that fresh herb smell! Oooh I know! And cilantro goes bad so quick. I started freezing it last year. That and parsley and ginger… and parmesan rinds…and homemade fries. I freeze the herbs in a bag as they crush easily when frozen. No extra water in the recipe. I love all these ideas–but have a question. Won’t the cilantro/basil/whatever turn brown if you simply put it in a freezer bag? Will this really only keep for two months in the freezer? I do the same thing to preserve cilantro and parsley, except I process the herbs with a bit of water in my food processor first. This makes it easier to scoop into the ice cube trays more evenly. If I’m processing basil, I add a bit of olive oil instead of water to keep the basil from turning black. I saw this tip the other day on America’s Test Kitchen too. I am going to have to try it. I was just washing, drying and then freezing the basil from our garden, but I didn’t like the texture when I went to use it. I’ll have to try this method this summer! Thanks. Simple, but I wouldn’t have thought of it. Sharing plants with others who would enjoy trying to grow them gives those who might shy away due to lack of experience an opportunity and is a great safeguard against a time when something goes amiss for your plants!